Our most popular motorcycle grip by nearly 3 to 1. A Great Grip and a Perfect Fit for most Sport Bikes. 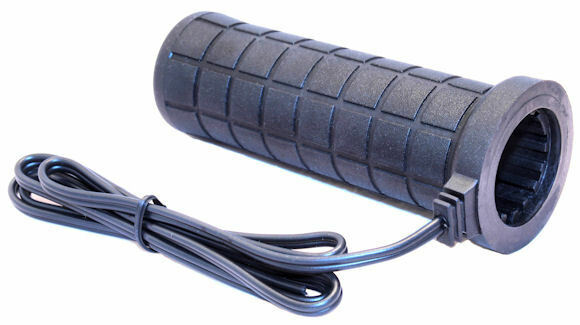 At 4-3/4" long and sized for a 7/8" handlebar this grip fits most sport bikes. Features our patented "burn-out proof" heating elements. Comfort-sized grip naturally reduces wrist and hand stress. Dual Heat - all our grips allow you to select high, low or no heat. Also available is an infinitely adjustable heat controller. Our unique internal Heat Isolation Ribs effectively limit heat transfer to the handlebars and put the heat where it is needed - the rider's hands. Custom Options: All our grips come stock with a three position (high, low, off) weatherproof toggle switch. Optionally you can select a handlebar mounted switch, a mini toggle switch or a variable heat controller. We recommend our epoxy because it is designed to take the high temperature without softening. Inside Diameter: Kit consists of a 2 grips with a 1" inner diameter for the throttle side and a 7/8" inner diameter x 1" outer diameter slit bushing for the clutch side . Both grips have an i.d. of 1.010" or 1.030"
Handlebar mounted switch housing, mini switch, variable heat controller.